IN ITS MID-YEAR financial review earlier this week, Argos revealed that, historically, its catalogue offerings appealed mainly to “less affluent customers”. However, conditions have changed and the retailer now believes it can have a more universal appeal across a range of socio-economic groups. Discount retailer Dealz has recently announced a fairly significant expansion, just a year after making a €6 million investment in Ireland. More people, regardless of their personal economic situation, are seeking out bargains. The shopping experience may be less glamorous but the outcome has become more important, it seems. Pete Lunn, an expert in consumer economics and psychology at the ESRI, says people don’t derive satisfaction from the products they buy. “What matters is how good the deal is,” he continues. Although the notion of value has always been important, people’s perception of it has mutated over the past four years, according to Behaviour & Attitudes director Phelim O’Leary. The arrival of the savvy consumer was lauded a few years ago but now everybody is at that stage and considered a savvy consumer. “Right across the board, people have become used to or adept at dealing with austerity. The recession has become normality. Even the word itself is used less. Initially we were hoping for a return to the old normality but that has changed now. “People are looking for bargains rather than bling. Understatement rather than overstatement. It’s all about the austerity credentials now,” he concludes. But how far will we go? 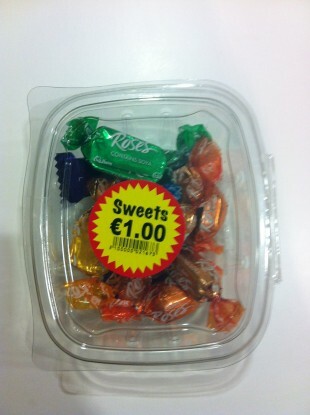 We spotted this carton of Roses chocolates in a Dublin city centre convenience store earlier this week. Are we now so susceptible to a bargain that we’ll do without ingredients lists and shrug off the absence of sell-by dates? Lunn says that there hasn’t been sufficient behavioural research carried out during the recessionary years to answer such questions yet. Most of the recent published findings have been about the booming economy of the 1990s and early 2000s. However, there are truths in personal observations, he adds, most of which are linked to the recession (or the normality which has emerged as a result of the downturn). “Tesco supermarkets have bargain shelves that explicitly sell almost-out-of-date food. Those shelves are getting bigger and are stacked and opened at a particular time. You will often notice queues forming for the products,” he tells us. In the most recent B&A Consumer Confidence Tracker, the market research firm found that negative consumer sentiment towards the economy continues to rise and, in line with those concerns, negative attitudes towards spending intentions have returned. In short, people are not enjoying or are fearful of spending what money they do have. But when is a ‘bargain’ actually not a bargain? William Poundstone, author of Priceless, a book that looks at the psychology of prices, believes it is very easy to fool people about what is good value. Prada stores carry a few obscenely expensive items in order to boost sales for everything else (which look like bargains in comparison). People used to download music for free, then Steve Jobs convinced them to pay. How? By charging 99 cents. That price has a hypnotic effect: the profit margin of the 99 Cents Only store is twice that of Wal-Mart. Why do text messages cost money, while e-mails are free? Why do jars of peanut butter keep getting smaller in order to keep the price the “same”? The answer is simple: prices are a collective hallucination. Limited offers, exploitative reference prices (like, did that salmon ever really cost €11.99?) and multi-packs or bundles are used by sellers as techniques to trick customers into thinking they are getting a bargain. Because people don’t actually know what a “fair” price is, they cannot make a rational purchasing decision, he argues. The best advice? The shopper should ask if the item is needed, plus if they would want it as much if it was still at the original price? So before buying the carton of Roses, I should have asked myself, “Would I want these if they were in the tin for €5.99?” The answer: probably not. But I still feel the continuing urge to justify the rationale behind the purchase. I really did enjoy that early taste of Christmas after all. Email “Ireland, the recession and shopping: why we love a good bargain”. Feedback on “Ireland, the recession and shopping: why we love a good bargain”.